What is always interesting about fishing, is for the most part you never know what your going to catch. I try my best to keep everybody on their toes when we are our there casting. As you never know what cast will result in a fish of a lifetime or just something different. Well yesterday we had an encounter with Esox Lucius other wise known as the “northern pike”. While the big ones of the Manistee (over 40+”) I do not see very often and my couple quick encounters always seem to get off, this 30″ specimen was hooked about as perfect as one can with such a toothy creature. Honestly if one was going to target big Esox the next couple months are about prime, from now until there spring spawn. 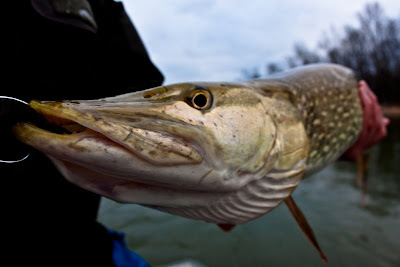 As the big northern pike will use river mouths and warm water discharges from the many harbors and ports along the michigan coast for their winter hunting grounds. While I personally don’t find them as the strongest fighters, there aggressive nature makes them a great target on the fly. And anything that decides that my flies are good enough food items to eat is always cool with me! Last winter I had the opportunity to fish with Ed McCoy for a couple hours just below Tippy Dam. Winter time trout fishing is pretty much over looked here in Michigan but honestly it can be pretty easy, as trout are schooled up and eager for any sort of properly presented meal. Enjoy the video. There are certain moments on the river that I never forget. Now yes it is part of my job to remember where I catch fish, but certain moments are burned deep into the memory banks. Certain fish you never forget. You hold onto these memories to share with other anglers and to relive each and every time you fish that particular area. Now each steelhead to me is a special steelhead, but also with certain moments or places certain steelhead are different or “more special” as well. 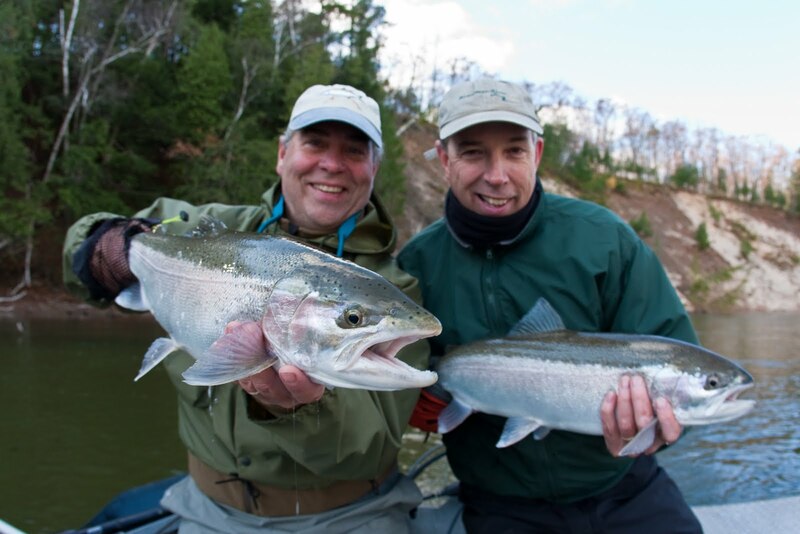 A steelhead that will travel an unknown amount of distance to engulf a streamer is a “special” steelhead. You remember the places where you catch these “special” fish. You look at these runs different, you remember the 100’s of cast that it took to give you the pull you where looking for. 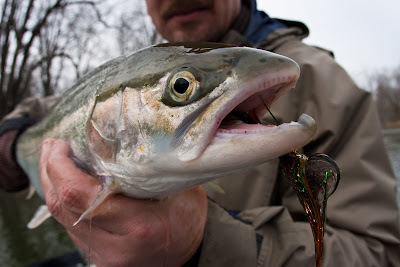 You remember the the numerous fly changes that it took to bring that steelhead to hand. You never forget the fish that eat’s your streamer! As I said before each steelhead is a special steelhead, but another memory that is hard to forget is when the stars are alined perfect and you find yourself with a double header. You want to talk about having your hands full of chrome, these memories are for sure special. One anglers will talk about for years. “Remember that time” kind of stories, when we had that double and this one went that way, and that one went this way. Steelhead truly never make it easy, but I love the memories that they bring!